The first thing you remember is waking up in the back of a van. There are people with you, also in restraints. Men in white suits are driving you to an unknown location. Then you pass a sign post. Who are you? How did you get here? Why are you here? Who are these people with you? Why are they treating you like this? 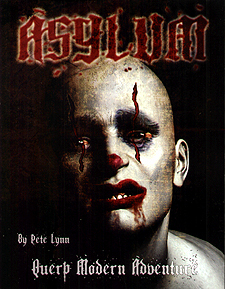 Welcome to Hofs Asylum - your own personal hell. This adventure introduces new character types, special skills, equipment and new rules on madness and insanity. This is not a stand-alone product. This adventure requires the QUERP Moder Core Rule Book.